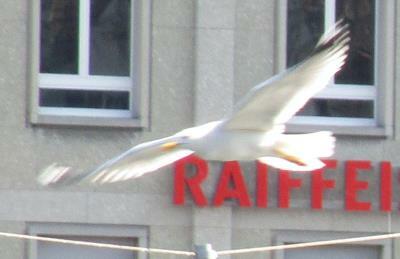 6 This is gull I found in Reuss river (very close to Chapel Bridge), Lucerne, Switizerland (sorry, not UK. But, I am pretty sure they are also found in UK) while on a tour. I was new to Europe and unable to ID this gull. Please help. 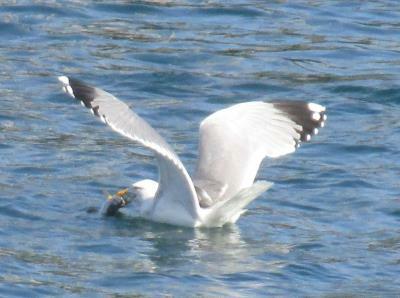 44 I am not too hot on gulls but this looks very much like a Yellow-legged Gull, Wolverine. 6 Thank you Mickc. From the checklist of birds in Lucerne, Switzerland (from Avibase checklist), I find that Larus cachinnans (Caspian Gull) also matches (from Oriental Birds database). Can you please check and tell if there are any distinguishing features? 44 There is not a lot of difference between the Caspian, Herring & Yellow-legged gulls but there is s very comprehensive article on the berksbird website that may assist you, Wolverine. The pink legs on a Herring Gull make for easy identification there. Photos of the underwing of a Caspian gull appear to have a light grey strip following on from the black tips whereas your photo seems to show an all white underwing. Your photos are very clear and I am sure you will be able to decide what it is. I am out of my depth here I am afraid! 6 Thanks! I will check out the website Mickc.